Rain showers early, then clear overnight. Low 48F. Winds light and variable. Chance of rain 70%.. Rain showers early, then clear overnight. Low 48F. Winds light and variable. Chance of rain 70%. A good novel can engage a reader for hours, even days. But a short story offers instant pleasures, and the difference in time required can be a determining factor in a busy life. After two acclaimed historical novels set in China—“River of Dust” and “Dreams of the Red Phoenix”—Virginia Pye turns to the briefer format in “Shelf Life of Happiness,” a collection of nine short stories, of which all but one are set in the U.S., and all of which focus on people who pursue—successfully or not—happiness. “New Year’s Day” centers on Jessica, a young teacher and churchgoer given to melancholia who lives a neighborhood away from a young couple who were murdered with their daughters, ages 6 and 4. Unable to stop thinking about the case, she sinks into further doubts about life until an outing with a friend spurs her to consider positive connections. Inspired by the horrific Harvey family murders in Richmond on Jan. 1, 2006, the story is particularly harrowing but also, in a strange way, ultimately uplifting. Two couples occupy the perilous territory of the title story: Nathan and his wife, Melissa, and Bill and his wife, Gloria. Friends since college who now work together at a publishing house, Nathan and Gloria seem permanently if platonically bonded. But a fleeting moment changes that appearance, as well as Nathan’s concept of his life. And the reader ponders two questions: Can one person’s happiness be bought at the cost of another’s, and must one person’s happiness depend on the reciprocity of another? 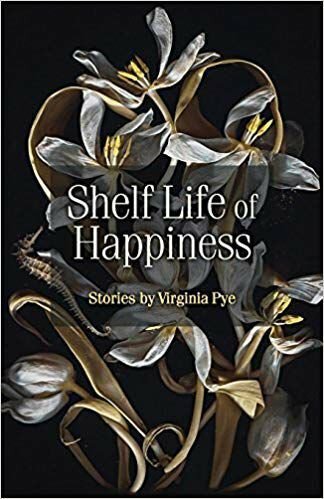 “Shelf Life of Happiness” shines with Pye’s ability to offer different takes on her subject, and she does so with smooth prose that never shouts “look at me!” but instead underscores its creator’s talent for whispered eloquence. And her endlessly fascinating characters confirm that her capacity to create them is not confined to her novels. Pye, a longtime Richmonder who now lives in Massachusetts, invests this collection with her bountiful imagination, her intuitive empathy and her storytelling instincts. Sometimes bitter, sometimes sweet, always moving, “Shelf Life of Happiness” rewards the discerning reader who seeks not only entertainment but also wisdom. Jay Strafford, a retired Virginia journalist, now lives in Florida.